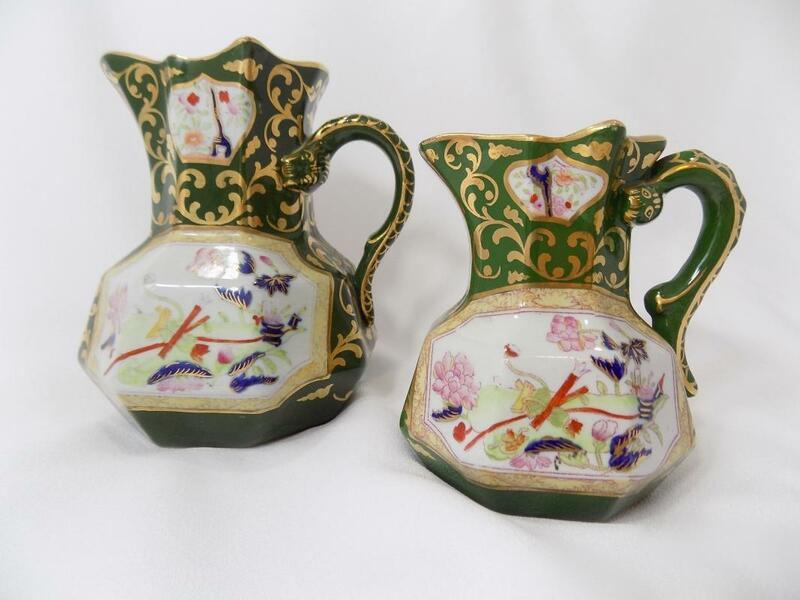 This handsome pair of English ironstone jugs were made by the famed Mason's of Lane Delph, Staffordshire. 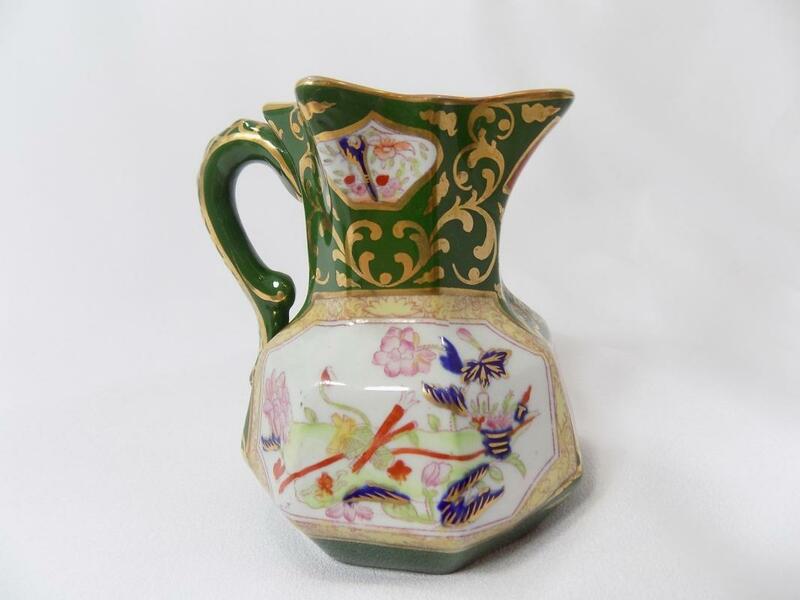 Among Mason's specialties were these octagonal pitchers, in the shape called "Hydra," (the serpent of Greek mythology) with snake handles, the heads attached below the gilded upper rims and the arched 'bodies' covered with golden scales. 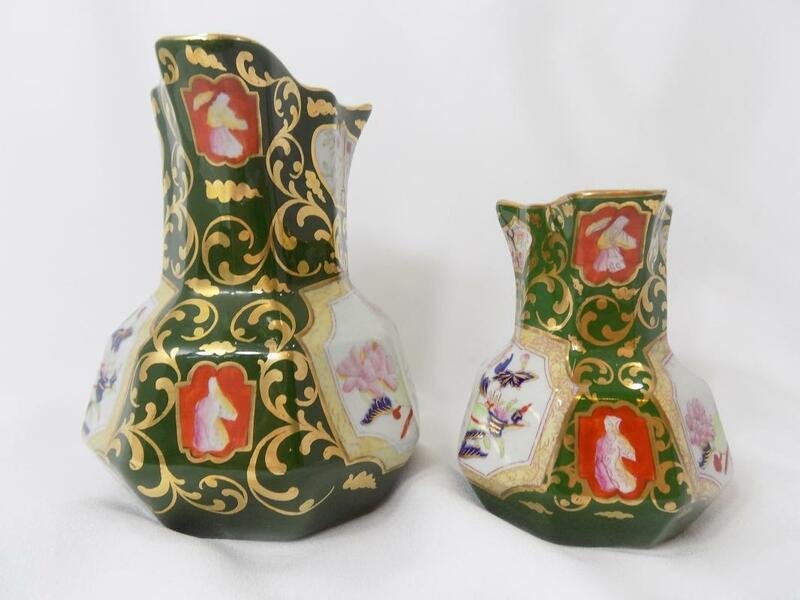 Both are made of pure white ironstone with identical Chinoiserie decorations in the Imari style, hand painted in panels on a deep green ground, a color difficult to fire and thus not common. Designs include pink peonies and other flowers and, in panels under the spouts, Asian figures on iron red backgrounds, the upper ones carrying parasols. The printed mark on the bottom of each was used circa 1825 until about 1840. 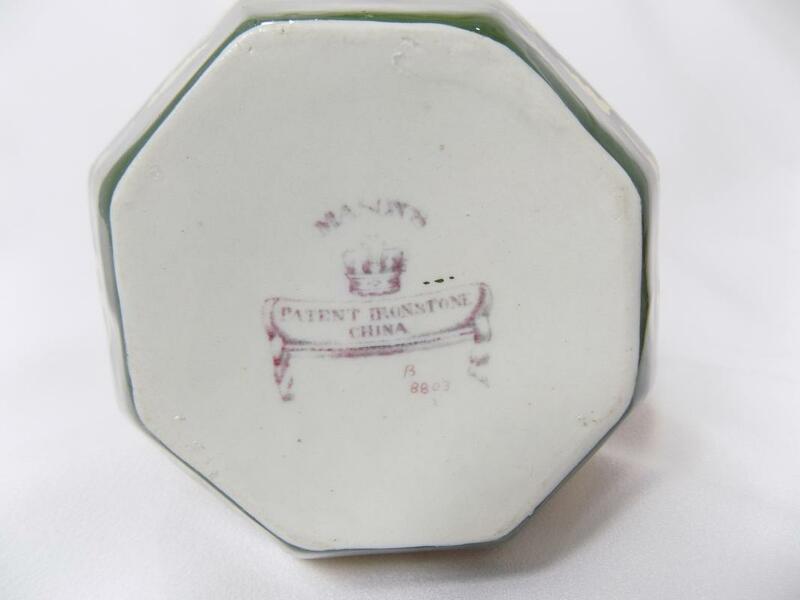 The mark consists of a crown topped with a Maltese cross, above it the word "MASON's" with a banner below the crown containing the words "PATENT IRONSTONE CHINA." 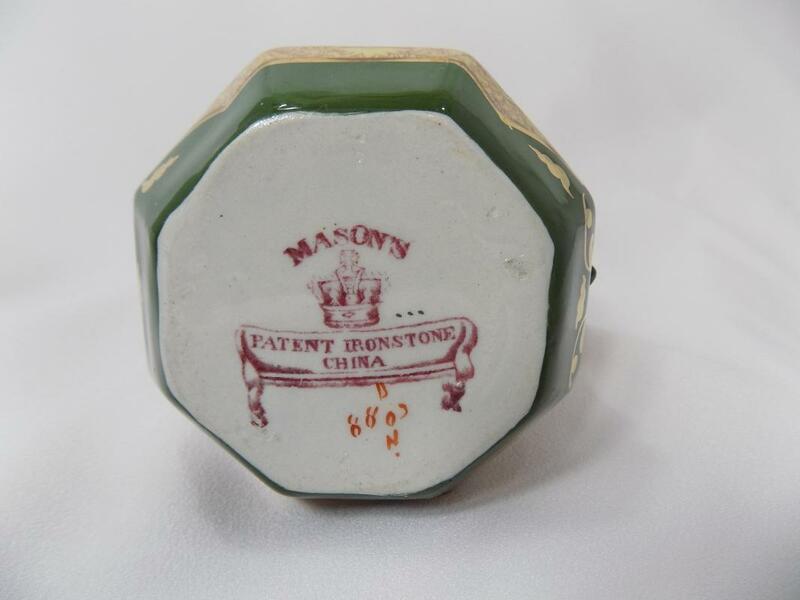 Charles James Mason coined the word "Ironstone" and registered his patent No. 3724 for Mason's Ironstone on July 31st, 1813. Notice the lack of the word "England," which was not added until 1891. 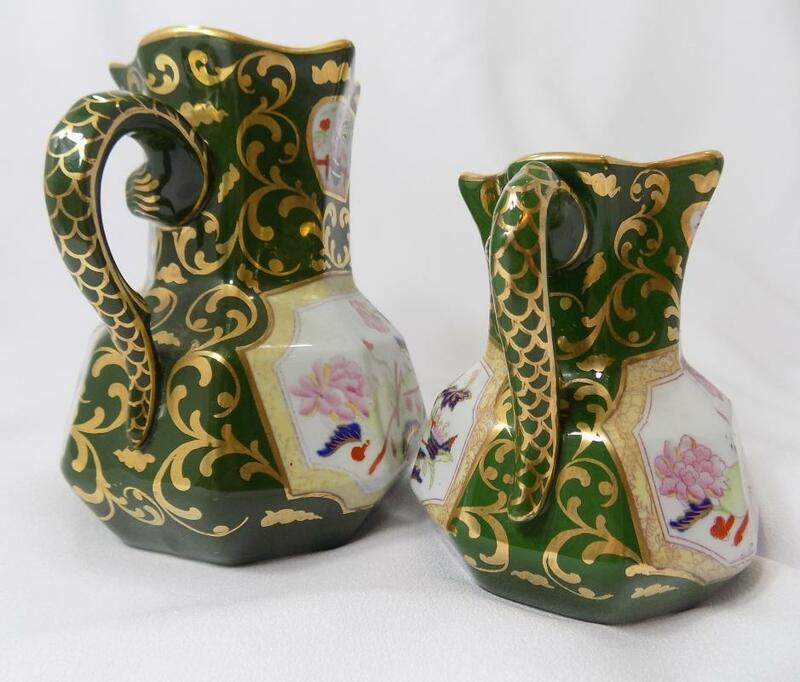 These jugs are in exceptional condition; not only are there no cracks or chips but there is very little wear, even on the gilt and virtually no manufacturing flaws that we could find. 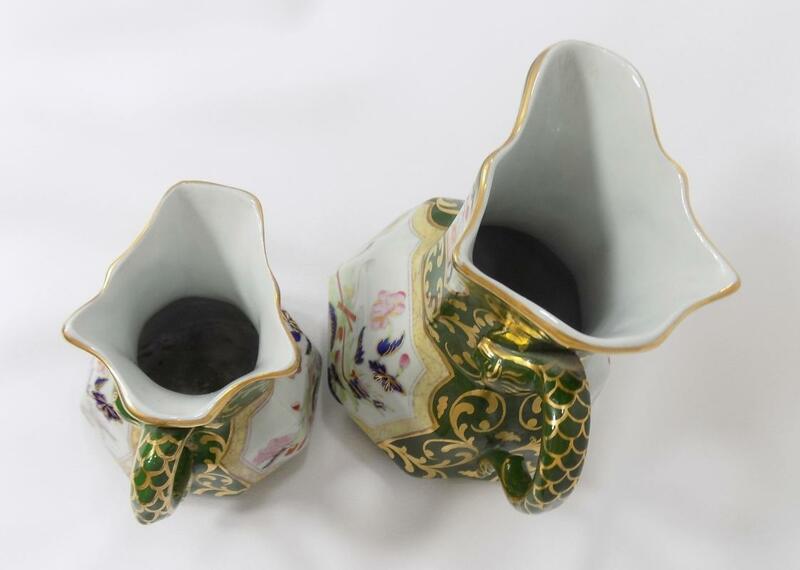 The larger of the two measures 6 1/4 inches tall to the spout, about 5 inches front to back and weighs 1 pound 2 ounces. The smaller is 4 1/2 inches tall to the spout, 3 1/2 inches front to back and weighs 10 ounces. 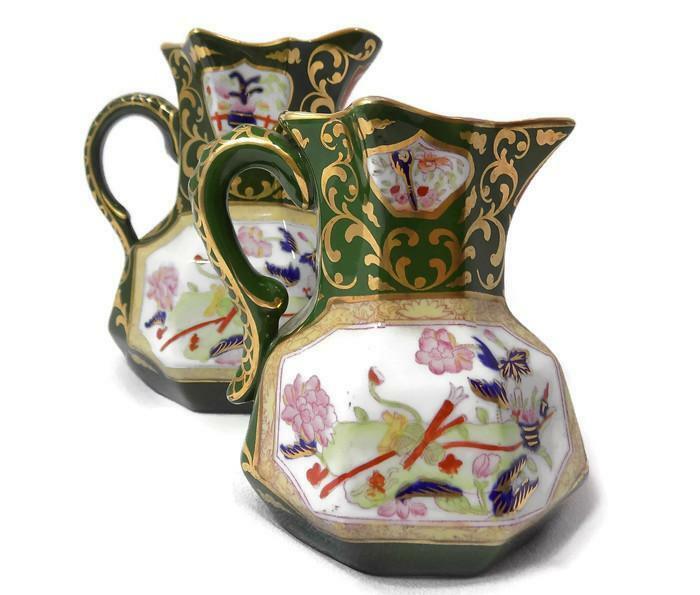 Mason's jugs are collector favorites, lovely to display in a grouping or standing alone.